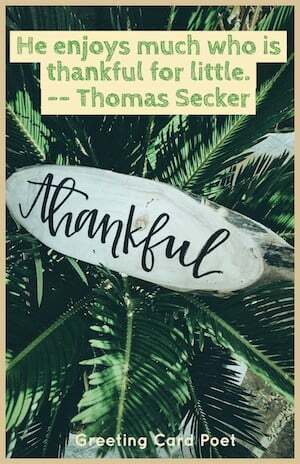 A life full of thankful quotes is an enriched life. If you want to lead a happier life, be grateful for everything you have. From friends and family, to the smallest things in your life, show gratitude. Remember, you can never shower enough of your thankfulness on those around you. Every heart has an abundance of gratitude and love in it that you can never exhaust it. Never fret in showing your appreciation for everything and everyone that comes your way. If you are looking for the best way to make this world a better place, share your gratitude. I feel a very unusual sensation – if it is not indigestion, it must be gratitude. On the fourth Thursday in November in the United States, folks gather to share a meal and celebrate Thanksgiving. Turkey, stuffing, cranberry sauce and pumpkin pie are on many a menu and it’s an opportunity for families to share their love with each other. The Thanksgiving holiday is also the kick off to the holiday Christmas season. Learn more about origin of the Thanksgiving holiday. Every so often we’re blessed by angles disguised as friends who enrich our lives more than we could ever have expected. It means so much to me knowing how much you care and that if either of us needs to talk, the other will be there. Appreciation can make a day – even change a life. Your willingness to put it into words is all that is necessary. Be thankful for what you have today. Work hard for what you have tomorrow. Your friendship is a special gift, generously given, happily accepted, and deeply appreciated. I appreciate you in countless ways and on countless days. A grateful mind is a great mind, which eventually attracts to itself great things. 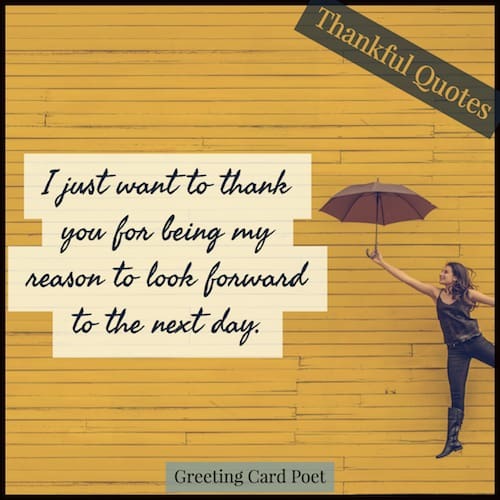 If you have any suggestions for our Thankful Quotes page, please let us know via the Contact page. Thanks. Thank you for coming into my life. Thank you for making me smile like crazy. And, thank you for making me happy. Thank you for always giving me the extra push I need. You’re on Thankful Quotes page.